The SMB Online Conference 2013 starts tomorrow. It will be three days of amazing content on the topic of Rebooting Your Business. We are happy to announce that you can now buy a one-day pass to any day of the conference. 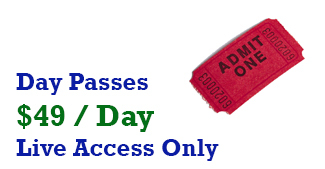 One-Day Passes are for "Live Only" access to the conference. If you want recordings, you'll need to buy a standard pass. Visit www.smbonlineconference.com for more details. An agenda overview is below. We have always offered a three-day live-only pass for $99. So if you're tempted to buy two one-day passes, you might as well just go ahead and buy the full three-day pass for $99. For all the details and all the options, please see the full SMB Online Conference Web Site. You're gong to love it!! !